We do not teach one specific grade. We meet with the principal, and he/she tells us which grade(s) would benefit the most from our program. As a result, our program teaches dance to students in grades 4 through high school. We have TWO teachers for each class, to better meet the needs of the students and model the dance steps. The students compete with students within their class, and not other schools. A disco ball is given to each school, to be used for the “Grand Finale”, (week 10). Trophies are given to the couples for best waltz, tango, merengue and swing. Trophies are given to the one couple who is the best overall dancer. A small revolving disco ball is given to the one student who shows the best effort and attitude. We have a Dancing with the Students Dance Troupe. These students were taught ballroom dancing in elementary school and have made the commitment to continue and take their dancing to the next level. They practice afterschool and come from eight different high schools all over Philadelphia. They have performed at the Franklin Institute, Art Museum, Please Touch Museum, Association of Children’s Museums, Charity Ball (11/09), and Sixers-Cavaliers basketball game at the Wachovia Center (3/2010). In 2003, life changed forever for Susan Martinelli Shea. Her son, Steve, was a sophomore at Fairfield University, Fairfield, Connecticut. in a senseless act of violence, Steve’s college roommate, Mark Fisher, was murdered. After much reflection throughout the year, Sue decided to quit her job as a special education teacher, and to volunteer in Philadelphia at the Gesu School. While at the Gesu School, in 2005, Sue decided to start a ballroom dancing program in Philadelphia. Being a special education teacher, she knew nothing about ballroom dancing! Sue went to the Arthur Murray Dance Studio, armed with a folder of research on children and dancing. There, she met Samantha Bellomo, an Arthur Murray dance teacher/manager/choreographer as well as a Barrymore Award winner. A friendship and a partnership blossomed. Sue and Sam share the common goals of teaching respect, manners and dance, while enjoying exercise and a lot of fun. With the artistic direction of Samantha Bellomo, Dancing With The Students has developed into a non-profit organization that offers ballroom dance instruction to students in grades five through nine, in various schools located in and around the Philadelphia area. A 10-week program in Waltz, Swing, Tango, and Merengue is taught by qualified ballroom instructors with emphasis placed on “personal flare,” with each child bringing their own personality and style to each dance. Manners, respect, and etiquette are also emphasized. In 2009, Dancing with the Students Troupe was created. These high school students have performed at the Charity Ball at the Union League, at the Philadelphia 76ers games, and the Storybook Ball at the Please Touch Museum. Today, Dancing with the Students is a successful local Philadelphia community program. 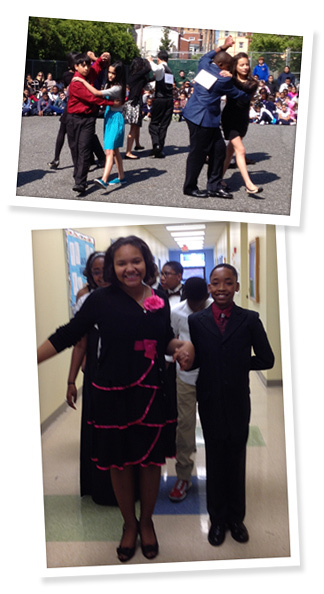 Our students have shown their dancing talents and performed all over Philadelphia. They will continue to share the joy that dancing has brought to their lives. © 2015 Dancing With the Students. All Rights Reserved.